Fun tramping, biking and caving in the Central North Island conservation areas was a great way to start the New Year.TheMahi Aroha: Doing it for Conservation summer programme has now come to a close, leaving great memories and inspiring people to get back out and continue to enjoy our local natural treasures.The programme included some popular favourites such as Creatures of the Night and the Kaimanawa Wild Horses.The 50th anniversary programme also introduced some new trips such as trying out the new Great Lake Trail and a sustainable future tour. “Mahi Aroha is not only about encouraging people to explore and learn about conservation, but to also get involved in conservation” explains DOC Outreach and Education Co-ordinator Kerryn Penny.Project Tongariro and DOC partnered to develop and deliver the Mahi Aroha programme. "It was a great opportunity to explore, learn and have fun with an enthusiastic public, helpers from DOC, community groups including Bike Taupo and the Pukawa Wildlife Trust, and local businesses like the Wairakei Golf + Sanctuary. It was a collaboration of people and organisations with like minded passion for and commitment to conservation in our community. We are looking forward to the next 50 years of Mahi Aroha”, says Paul Green, President of Project Tongariro. Click here to view a gallery of images from the 50th anniversary summer nature programme. Project Tongariro and DOC are hosting a 'Volunteer Appreciation BBQ' to thank all our lovely vollies for their ongoing commitment and passion. Without you the work that we do and the achievements we make would not be possible. This is where we will announce the winner of our volunteer mystery prize. Every time you have volunteered whether it was trap checking, bird monitoring, event marshalling, kite making, kiwi transporting or any of the other wonderful jobs you do for us, you have been entered into the draw! The BBQ is just a chance to get together and celebrate the work that we do. Hope to see you all there. Can we have a volunteer to cook the BBQ? Nah just kidding! Please RSVP to Kiri on info@tongariro.org.nz if you can make it. If mountain biking is your thing, this trip is not to be missed. Join a group of avid mountain bikers as they explore the new Great Lake Trail, part of the national cycleway project. Over the weekend of March 14 (full day ride ) and 15 (half day ride) with an overnighter in Taupo or Kinloch, this is a chance to see all the hard work that Bike Taupo have been putting into the construction of this amazing trail. Always a favourite on the annual calendar, Kite Day this year was as fun and colourful as ever. The weather - both the sun and the wind - played its part and kites of all shapes and sizes took to the sky! Thanks to everyone for helping out and to Chateau Tongariro for providing the BBQ food once again. The new Volcanoes of the South Wind by Karen Williams is selling fast! To celebrate the book and to recognise Karen's contribution to the life and legacy of TNHS, we held a small launch function at the Tussock Tavern in early December. 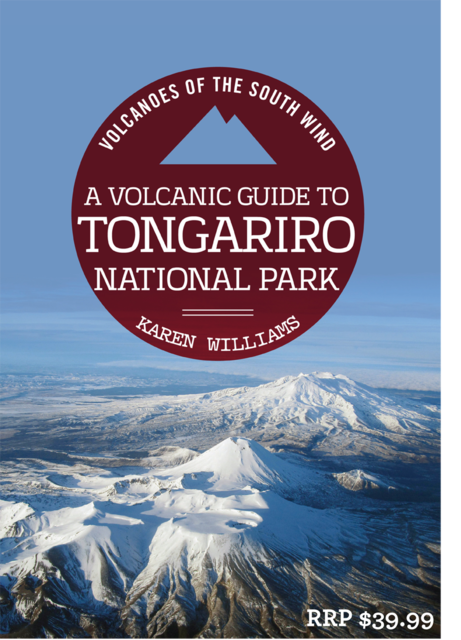 If you would like a copy of this book please order through our website as proceeds from website sales are invested back into the ongoing work we do in Tongariro National Park. 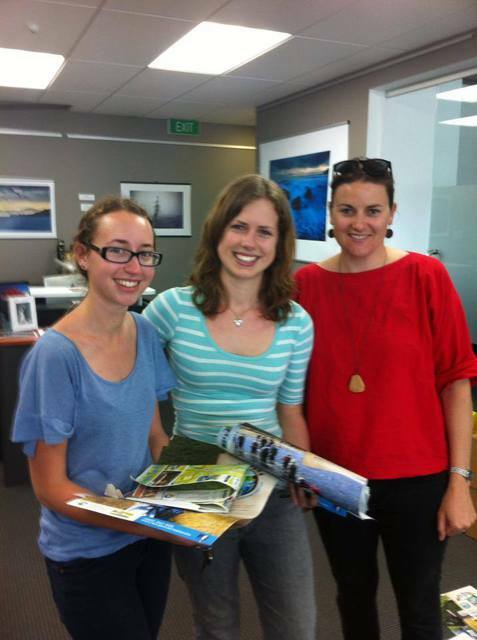 Our two interns Laura and Carly have certainly been enjoying their time here in the Turangi / Tongariro area. I have also constantly been enjoying great feedback about both of them from those DOC staff who have they have worked alongside. This year both Laura and Carly are completing their placement assignments doing presence / absence studies. 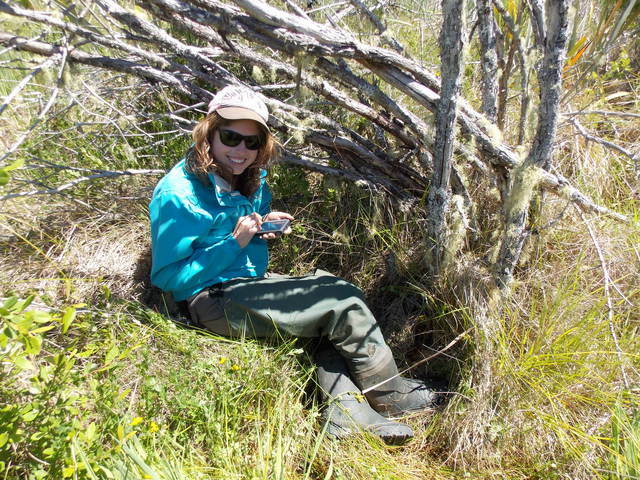 Laura is surveying gecko/skinks that have been recorded as being seen at Long Beach up at Lake Rotopounamu in the past. She is using various techniques including honey & banana mashed together and pureed pears to attract the geckos into tracking tunnles. So far it hasn't been successful, but she's not giving up! Carly is placing bat recording boxes on various properties around the outer skirts of Turangi to determine the presence of bats. She has had a good success rate with recordings at Tongariro National Trout Centre and Turangi Golf Course. This is exciting as there are no previous recordings of bats this close to Turangi and local bat expert Kerry Borkin is considering continuing the project. Laura and Carly finish their internship with us on Friday 21st February when they will return to Waikato Uni to continue their studies. I wish them the best for the future and will miss them keeping me company at the office! I hope they will return to the area in the future, like another Intern - Jenny Hayward. Jenny, who completed a internship with us three years ago is now working with DOC's Renee Potae at Whakapapa. This such a great outcome and I am very pleased to see the internship programme making such a impact. Our appreciation goes out to Craters of the Moon Trust who have made the internship programme possible through their generous funding. Pictured on the left our intern Laura who is recording data in Te Matapuna Wetland. The forest at Rotopounamu is flourishing this season. Pest numbers are at extremely low levels as a result of the combination of initial knock down by an aerial 1080 pest operation in June 2013, followed up with further control of rats in the core area, and trapping of stoats within the newly established 1100 hectares. Many of the tall forest trees such as red beech, rimu, maire, kamahi, hinau and others, have flowered prolifically this season, likely because of last year’s sunny and hot conditions and now have heavy (mast) seed crops. We expect that this combination of low pests and abundant food will be allowing most species of birds to breed successfully, and some will raise multiple broods. Project Tongariro interns and DOC staff are currently undertaking five-minute bird monitoring and it is our expectation that we should see a positive increase from last year. The masting of red beech and rimu, both abundant trees at Rotopounamu will however likely to lead to a large increase in rodents this coming winter and spring and we are currently considering how best to plan for this if it arises. Project Tongariro has a significant trap system in place as part of the ongoing Rotopounamu restoration project. As the biodversity interns finish up their summer internship and head back to study at the Univeristy of Waikato, we are in need of some 'trap checkers'. You'll join a dedicated crew of vollies who currently perform this integral role. If you would like help out with this task please get in touch with Kiri on info@tongariro.org.nz. Two groups of Project Tongariro volunteers will be spending five days each at Boundary Stream undertaking volunteer work for the Poutiri Ao ō Tāne project. Tasks include helping to hand feed Cooks Petrel chicks that will be translocated from Little Barrier Island; feeding kaka held in an aviary until their release; bird monitoring etc. Free time will also be available to explore this beautiful area. Accommodation is provided and the only cost is your transport and food. Additional people are needed for the group that will travel to Boundary Stream on March 24 and return late morning or afternoon on March 29. Contact: Mary Monzingo (monzingo@ihug.co.nz, 07 378 8636 or 021 02467875) and/or have a look at www.poutiri.co.nz. Tussock Traverse - Another amazing event in the park! It was another amazing day for the annual Tussock Traverse. Our awesome team of event marshals and base area helpers really roll their sleeves up to help make this event a stand out in the event calendar so thanks for your contribution. Thanks also to the team at Total Sport for their awesome event organisation and to Chateau Tongariro for their ongoing support and commitment to this event. A weekend of activities is planned to celebrate these two special anniversaries in October 2014. We're delighted to report that two of the Project Tongariro's original patrons, Edna Williams and Shirley Geering, will be joining us along with other family members. They include Sir Lloyd Geering who has kindly agreed to be our guest speaker at the anniversary dinner to be held at Chateau Tongariro on the Saturday evening. In addition to the AGM, there will be opportunities to visit Lake Rotopounamu during the weekened in the company of society members familiar with Project Tongariro's successful biodiversity work there. Weather permitting, Dr Harry Keys and Karen Williams will lead a trip over the Tongariro Alpine Crossing. A variety of accommodation will be available. The next newsletter will have more details so you can plan to help us celebrate. The Zero Risk King of the Ring in Taupo in December was very successful raising significant funds for the Taupo community. As a charity recipient from the event Greening Taupo raised $5500! Thanks go to the organisers and sponsors of the event and of course our boxer, Chris Rangi. We would like to specifically thank the generous people and businesses who contributed to our auction prize pool - Bill Fleury, Mary Monzingo, Michel Dedual, Taupo Native Plant Nursery, Tongariro Lodge, Ruapehu Alpine Lifts, Wood Pigeon Lodge, Grass Growers Ltd, Wairakei Resort and Wairakei Golf + Sanctuary. We have also launched the Greening Taupo membership opportunity. Individuals and families have the opportunity to be part of the Greening Taupo initiative and 'green up' their own backyards. A $40 annual membership fee gets you five free plants plus ongoing discounts from the Taupo Native Plant Nursery. Greening Taupo is also pleased to welcome Chris Jolly Outdoors and Quality Print onto the Green Team. It's great to have you on board guys! We are busy preparing the upcoming planting season with a number of community planting days in the schedule so stay tuned to Facebook and Classic Hits so you can join us out there greening Taupo! The first to watch out for is a planting day in Wairakei Tourist Park with Wairakei Resort and Huka Honey Hive in April. If you can't make it along to this planting day, don't worry, there are several in the pipeline and we need all the help we can get! In the media recently you may have seen mention of plans which are "hailed as the Department of Conservation's largest ever species protection programme, dubbed the "Battle for our Birds". The $21 million project aims to protect 25 million native birds a year over the next five years. Project Tongariro Presdent Paul Green says "It is encouraging that a decision has been made to extend animal pest control in New Zealand. Predation of our native wildlife is alarming and we must act now with the best tools we have to save further extinctions in the next generation". and pick up a copy of the February issue of Wilderness magazine which has a comprehensive artcile called 1080:The Truth.